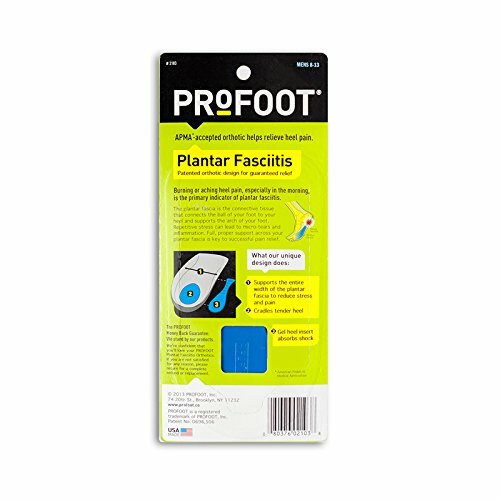 ProFoot Plantar Fasciitis Heel Insert Men's only $3.30! ProFoot Plantar Fasciitis Heel Insert Men’s only $3.30! Relive the pain of Planter Fasciitis for less with this! Hurry and get the ProFoot Plantar Fasciitis Heel Insert Men’s, 1 pair today for only $3.30 (regularly $4.76) from Amazon when you clip the $0.75/1 Coupon and opt to subscribe and save to 5 or more items in one month! There is no commitment with Subscribe & Save. You can cancel at any time! Plus, get free shipping!! Details here! Want it now? You’ll still get FREE shipping (2-day for Amazon Prime members) when you purchase $25 or more of eligible items across any product category. Lightweight to help prevent fatigue accepted by the American podiatric medical association made with vita foam r XD for molding support men’s one size fits all. Buy the ProFoot Plantar Fasciitis Heel Insert Men’s, 1 pair from Amazon.